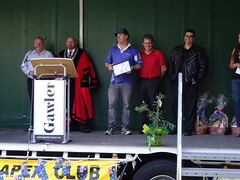 Australia Day was celebrated in Apex Park. Community Group of the Year – Gawler History Team Inc.
All money raised from the Australia Day breakfast was used to purchase stock feed for farmers affected by the bushfire in the Barossa Region in January 2014. 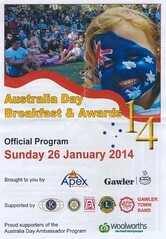 Please click here for photos of the 2014 Australia Day Breakfast. 175 years ago, Gawler citizens were indeed a hardy lot but the burial records show that people died of Typhoid, Dropsy, Dyptheria, Measles, Convulsions, Whooping Cough, and Dysentry. Many children were lucky to reach the age of 2. Do you remember Australia Day Breakfast 2014 ? Then Join up and add your memory here.